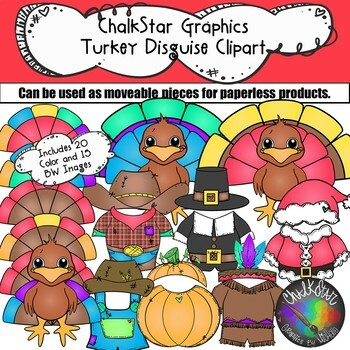 This adorable Disguise-a-Turkey Clipart set is perfect for paper or digital resources. 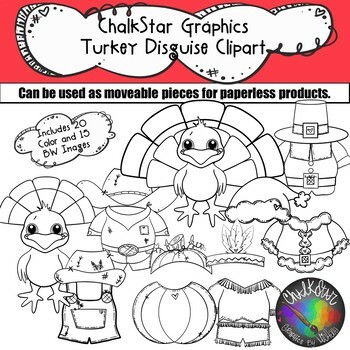 This set allows you to customize your Turkey's tail feathers and swap out his costume disguises. 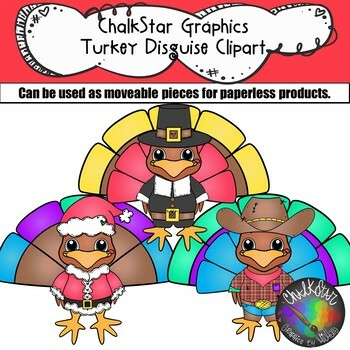 Dress up your turkey as a Farmer, Cowboy, Pumpkin, Native American, Pilgrim or Santa. This set includes 35 total images including 20 Color images and 15 Black and White images. All images are 300 dpi and and come in PNG format with transparent backgrounds so the lines stay crisp and can easily be layered into your creations. The images are bundled into a zip file. Please be sure you have a program to open this type of file.